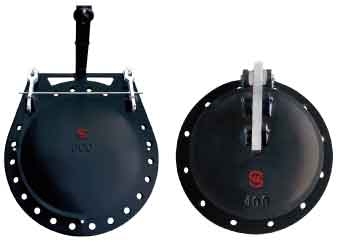 The flap valve shape is round which is usually installed on embankments or the exit of the pipeline end for he pump and water plant draining water. It prevents the damage from river reflux. The velocity of flow helps the valve opened. The weight of flap helps the valve closed. The flap valve has two designs which are single arm type and double arms type, and it also has self-lubricating bearing. The valve cover is strong which can bear the water hammer when the valve closed. When pump stops, the inlet water level is higher than the outlet water level 10cm, which helps flap valve closed exactly. Hinge pin is dual shear design. Arm controls the flap movement by the adjustable pivot. Anti-locking bar ensures the flap valve open/close in normal situation. NOTE: Ø2000 ~ Ø2600 Can be made as customer’s requirement.